Imagine being a sailor on a ship like Popeye. You remember he had a strange addiction to eating spinach. Popeye increased his strength from a wonderful green that is dense with nutrients. Could you blame the guy, spinach is a superfood. How would he be able to eat an endless supply of Spinach if there were no cans? He might turn to grow spinach in containers as a way to become a Green Thumb Gardener. Growing spinach in containers or pots is a great way to get your greens if you are limited on space or sailing the ocean. You will learn the basics of growing spinach from seeds that can also be applied directly in your garden. Growing spinach in containers or pots starts with selecting a container that is at least 12 inches deep as spinach has a large taproot. You want to place your container in a spot that gets anywhere from 4-6 hours of sun. Next, you will need humus loose soil that is rich in nitrogen and in a pH range of 6.5-7.5. You want to direct sow spinach in your container as it does not transplant well and space them about 4 inches apart for a total of 9 plants in a square foot area. Spinach (Spinacia oleracea) comes from the Amaranthaceae family. There are really only 2 types of spinach plants – smooth leaf and savoy leaf. Both types of spinach grow well in containers or pots. The smooth leaf type is the baby spinach leaves in your supermarket. They are much easier to clean and store, so commercial growers typically grow this spinach variety. The savoy spinach variety is the crinkly leaved one type. This spinach variety tends to bolt much slower and stands up to the much more temperature weather. Check your spinach seeds packets for specific instructions though. Spinach is one of those cool weather crops that produce vast amounts of nutrient-rich healthy dark greens. This is the crop that you want to concentrate your efforts on in the fall time and early spring time. Most spinach plants don’t do well in the summer or hot conditions, so you might want to wait until the other seasons to plant. You can find some slow bolting spinach varieties that might give you a better crop in late Spring/early summer, but it will be limited. Depending on your climate conditions, it can also survive through the winter if far enough in its growth cycle. Ok, so you heard that growing spinach from seed is best during the spring and fall. 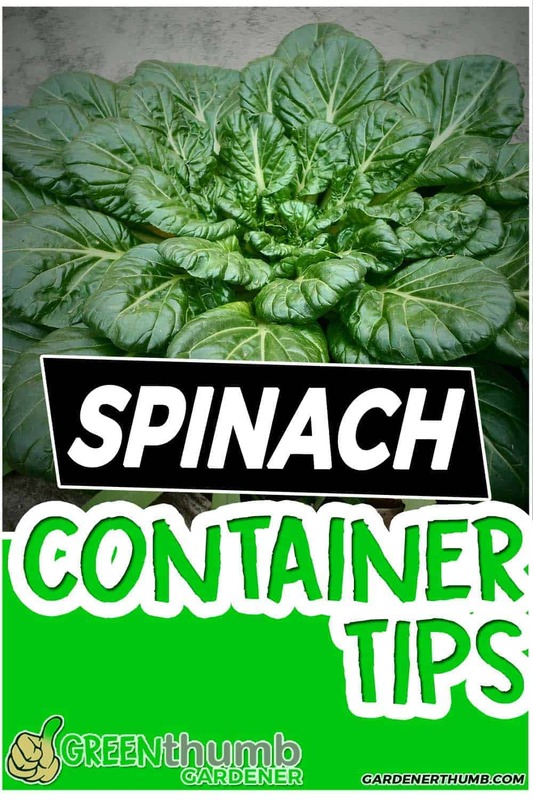 Let’s dive into why it is so beneficial to grow spinach in containers. You just started gardening this past summer or maybe you want to be a gardener. You grew your first successful tomato from seed and maybe some cucumbers in the blazing summer. It is getting late in the summer and your harvest is slowly waning. You really caught the Green Thumb and itching to grow some other vegetable from seed during the fall. Why not grow spinach from seed? Spinach is packed with nutrition. According to Healthline, “By weight, spinach consists of 91.4% water, 3.6% carbs, and 2.9% protein. There are 23 calories in 100 grams (3.5 oz) of spinach.” Wow, no wonder why Popeye loved this stuff. It is good for the muscles. Spinach is an excellent source of Vitamin K – Speaking of nutrition these smart guys say it helps with bones.. “minerals like manganese, copper, magnesium, zinc, and phosphorus also help in building up strong bones.” Who doesn’t want to build strong bones? You can fit 9 plants in a square foot area. We all know that once you start planting, you want to plant more. This is one of those plants that can be packed in a tight spot and doesn’t get greedy with real estate. Planted in early spring and fall means fewer pests. You know how it goes during the summer. Fighting off aphids, hornworms, and every other critter who wants a meal. Planting spinach in containers during these season eliminates most of these bugs. Get your Green Thumb in the winter – You heard it, spinach plants can actually be grown during the winter. You may need a small cold frame or some type of covering to grow spinach in containers during really frigid weather. Grab your container. 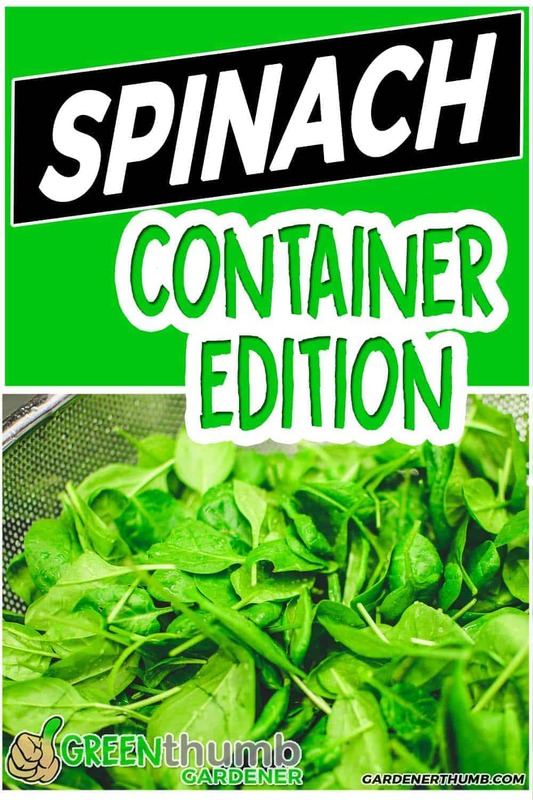 You want a 12″ inch container because the spinach plant does grow somewhat deep. You can get away with smaller containers, but it may be a little stunted. Add enough potting soil to fill it up. Make sure you have really loose soil as this is key to growing spinach. Soil that is too compact will slow down the growth since spinach roots like to breathe. Mix in your amendments such as compost or fertilizers that you want. Spinach needs a balanced supply of nutrients. You won’t have to do any supplemental feedings if you supply it right from the start. Determine where you want to place each seed. Ideally, you can fit about 9 plants in 1 square foot space. You want to place the spinach seeds about 4 inches (11 cm) apart. You can draw a grid and mark a spot in the middle to help you get a good placement strategy. Refer to the back of your spinach seed packet for some specific guidelines. Place each seed in the hole you indented in step 3. 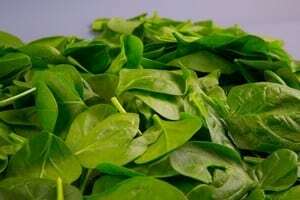 The spinach seeds should be at a maximum depth of about 1/2″ (13 mm). Water them generously. Spinach seeds take about 7-14 days to germinate. You may see them germinate a little sooner if the weather is warmer. Check out this post here if you want to get the most ideal spacing for your spinach plants. You got your perfect container and filled it up with some potting soil. Planted your spinach seeds in your container and watered it. Where do you need to grow them for the largest yield so you can be like Popeye? Trust me, you can grow spinach just about anywhere. A garden location, a porch, or even a tucked away area will work if you get at least 4 hours of sun. Let’s look at each season to know where its best. Spring– Spinach grows best in a sunny to partial shade spot if you plant them in early spring. 4-6 hours of direct sun is the best. It is still pretty cool out in most areas, so there is no need to worry about it bolting. Summer – You might want to be daring and you planted some crops late spring because of just like spinach (try Malabar spinach for summers). It is best to place these guys in a shaded location to minimize the bolting potentials. Fall – This time of year is the best to grow spinach from our experience. Place these spinach plants in full sun before it becomes winter to get a bountiful harvest. Winter – You will need as much sun as possible since the days are shorter. You can even put these guys up in a cold frame or greenhouse to survive frigid conditions. Check out Eliot Coleman’s book here as he is the master of growing veggies in any climate. Really the best way to grow spinach in containers is to just get started. Your thumb will only turn green when you get dirty. Just get out there and plant what you have, where you can, and make the best of it. Take notes of what worked, what didn’t work, and experiment as much as possible following the guidelines above. 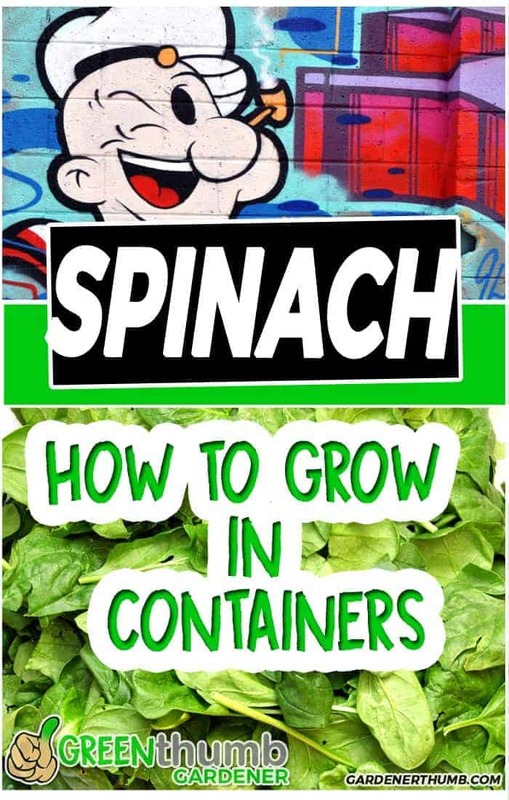 Check out our monumental guide about growing Spinach here. Let us know in the comments below what Spinach plants you grew and what time of year you. We always like hearing the garden experiments that are outside the norm.